We are now back in Christchurch but I did manage to get a bit of banding in before leaving Q/Town. I had sessions both around the home property and in the neighbour's orchard. Silvereye - 26 (18) among the recaps were several banded back last Sept. perhaps indicating a flock returning to the area. Tui - 7 (3) the number of Tui that are about continues to amaze me. Bellbird - 3 (4) another female caught brings the total to 6 with the male total at 25. We will be heading back south for a while next week so should get some more banding in then. I have had a couple of sessions in the last few days. One at the neighbours apple orchard where I caught mostly Silvereyes, although numbers were well down with fewer birds about. The other session was here where mostly new Tui were caught plus a few Bellbirds. The combined total caught was 38 birds of 5 species with 31 new and 7 recaps. Silvereye - 15 (1) as well as fewer birds feeding on the apples the nets were poorly positioned. Bellbird - 2 (3) the 2 new birds were both female the ratio is now 5 female to 23 male. One of the new female Bellbird. Tui - 8 (2) there appears to have been an influx of new birds in the last week or so. Of the 10 birds caught 9 were female. this is a big contrast to previous sessions. We have been back in Queenstown now for several days and I have managed to get a bit of banding in. I have had a couple of sessions here and a couple in the neighbours apple orchard where there are a lot of apples left on the trees. Silvereyes are at the moment in large numbers in this orchard. There are still heaps of apples to keep birds well fed. Have caught 106 birds of 9 species with 89 new and 17 recaptures. Bellbird - 5 (1) All were males, Have now banded 25 birds here and all but 3 have been males. Tui - 5 (2) although not as biased as Bellbirds males also dominate the catch. I have run out of bands for them and am waiting on some more from the Banding Office. When I first started banding here I hadn't expected to catch Tui and didn't bring any YP bands for males. After catching one and releasing it unbanded I got some bands for them expecting to catch half a dozen or so. I have now banded 32 and there are still unbanded birds about. A Tui caught in a net would make a good candidate for an "Angry Birds" show. Silvereye - 61 (8) the majority have been caught in the apple orchard next door. 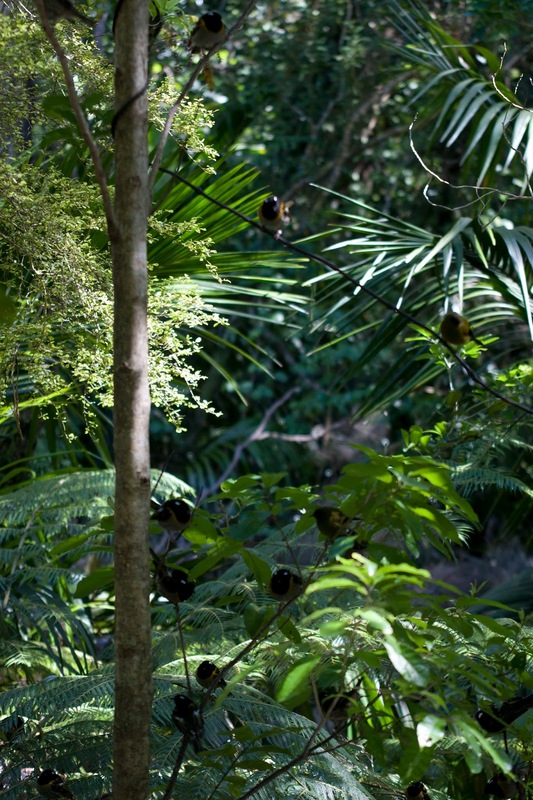 The main hihi field work on Kapiti Island has finished at the end of March and it was a solid season overall. 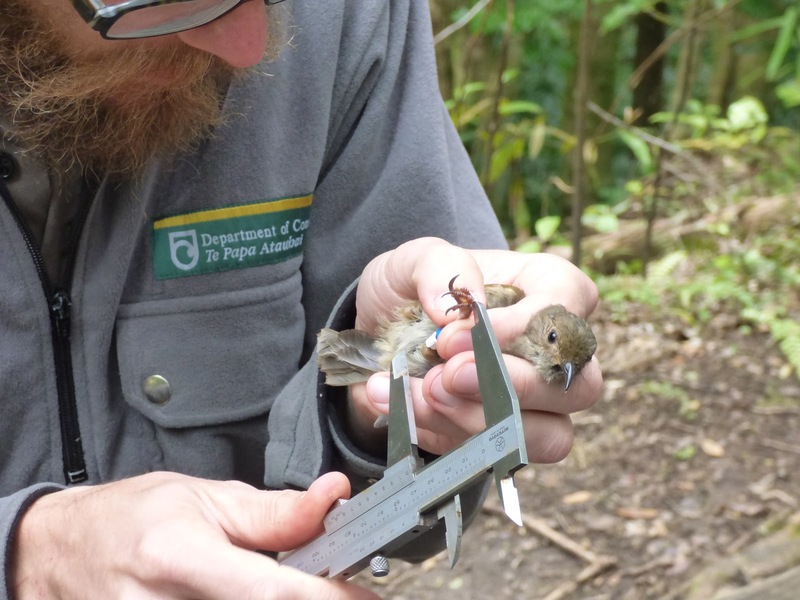 A total of 134 birds were identified throughout the season. This number is made up of 97 adults identified in the October 2015 pre-breeding census, and 37 birds banded throughout the season - 20 adults and 17 juveniles. The pre-breeding census count of 97 birds is slightly down on the previous season where 104 birds were identified. But the total end of season figure of 134 is slightly higher than the 129 identified at the end of the 2014/2015 season. From April 2015 to March 2016 a total of 3879L of sugar water was dragged up the hill with 3260L (84%) of this being consumed. This was an increase on distribution but a decrease on consumption from last season. The hinau on the island flowered strongly this season, as did the rewarewa. Both of these species are key food sources for hihi, while the rata and pohutukawa had a poor flowering season which may have affected the increased numbers of feisty and dominant korimako/bellbirds using the feeding stations. Count all the male hihi! The Hihi Heroes (volunteers) contributed approximately 560hrs to the hihi program during the 2015/2016 season which allowed for more sugar to make it up the hill and really helped with the accuracy of the pre-breeding census. The flash new interpretation sign at one of the feeding stations. Here’s hoping that many of the 134 banded birds (as well as the others that evaded capture) survive the winter and we have another successful season in 2016/2017. I am up in Christchurch at the moment and will be here for the next couple of weeks or so. We are taking possession of our new dwelling so will be living here for most of the time but still hope to get down to Queenstown on a regular basis to continue the banding study. During the period before we left Queenstown I managed to get some nets up on a couple of days and also had a session at the neighbours were Silvereyes have started to feed in an apple orchard. Mark the neighbour has left a lot of fruit for the birds. Since the last post 55 birds of 8 species were caught with 42 new and 13 recaps. Some big male Tui about but they don't seem to be as big or as heavy as those in Wellington. I should be back down there for a week or so later in June so hopefully will get a bit of banding in then.